Here's my sample for today's challenge at Stamp Something. The theme is "In the Wild", so naturally I pulled out Wild About You and got to work. I tried to make the animals the color they are in real life, but that made it hard to come up with a specific color combo, so I didn't! I just went with the colors of the animals and made it work. You will also notice there is no embellishment on the card (I think that's a first for me!). A couple of details: the grass was cut using a craft knife, and I just freehanded it. The elephant's eye is colored using a white gel pen, and the lion's mane was cut out and popped up on dimensionals. I made the bird red for a pop of color. Thanks for stopping by, make sure to check out the rest of the team's samples! Look at those animals peeking out from the grass! So cute!! Super cute Becky! I love the grass - it's very fun and adds such great dimension. OMGoodness is this ever cute, Becky!! Love the grass...awesome job! This was a really hard one for me, but you nailed it Becky! Way to go!! Excellent job on the challenge! 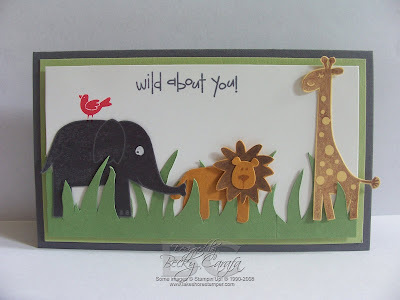 Fabulous card Becky...those animals are so cute! This is DARLING! I LOVE it! :) So cute! Thanks for sharing. You are so talented. Oh I love this, Becky. Such a fun card! This is so super cute!! I just love it!! The grass is sooooo cute I'm just gonna have to case this! Thanks so much for taking time to do your blog--I always enjoy your creations and find inspiration in them. Becky is this is cute! I love the tall grass! Great card! TFS! Ohh. i love this! soo cute!! super cute. I recently pulled out this set to work with. It is so fun. Love how you used it on this card. You nailed the challenge with this one, Becky! I love the wild scene you created and the realistic colors. A super cute card!